Really happy about those 4 titles being announced though!! Thank you so much, Idea Factory!! For supporting the otome genre and bringing Hakuouki Shinkai to the west! Finally I can get my route with Shinpachi! I'm really looking forward to next year with all that wonderful otome! Unless they intend on changing the story for some of the routes? Give others a reason to buy it a second time aside from the new graphics/ three (?) new characters? Ugh, I don't know. I'll still buy it, and I don't wish to rain on anyone's parade (If you're excited for it then I'm happy for you! ) but I was really hoping for Amnesia or a new franchise. it's not just 3 new characters, is 6 new routes. that's pretty much a whole new game, since the base game originally had 6 routes. Amnesia: V Edition [GET! ]; Code:Realize [GET! ]; Hakuouki Shinkai (Vita); Hakuoki SSL (Vita); Uta no Prince-sama (PSP/Vita); Collar x Malice [GET! ]; Black Wolves Saga (PC); Ken ga Kimi (PC/Vita); K Wonderful School Days (Vita); Arcana Famgilia -Ancora (Vita); Binary Star (Vita); Beyond The Future -Fix The Time Arrows- (PSP/PS3); Kenka Bancho Otome (Vita) ; Yuukyuu no Tierblade (Vita); Senjou no Waltz (Vita); Tiny x Machinegun (PC); ??? 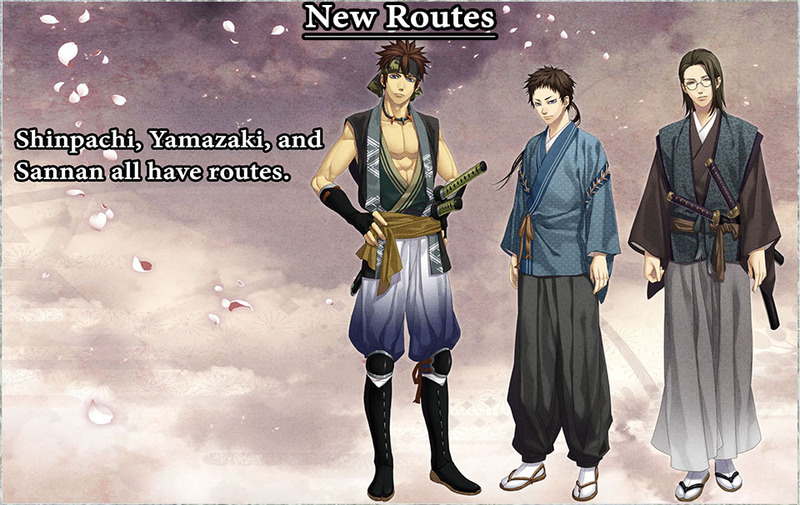 Like Lawra has said, there's six new routes. So, there's a total of 12 routes now. 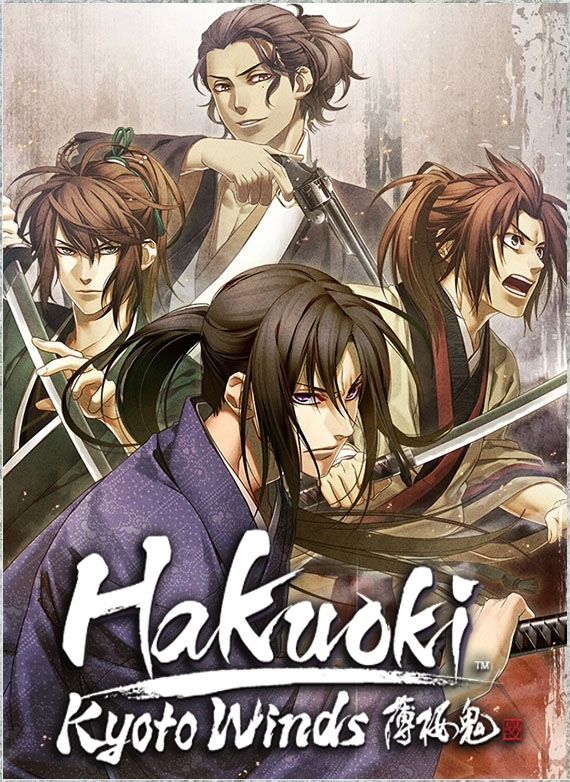 For me, the original Hakuouki was close to perfect and I don't exactly need a remake. However, it does seem to have a lot of new content, and I'm curious how they handle the new characters (e.g. Sakamoto Ryouma was assassinated in history--and halfway through the original game--and this was a pretty big plot point). I'll probably buy it as a new way to experience the story. Yes, I would've preferred a new IP like Clock Zero or Psychedelica or (impossible dream) another go at Beastmaster, but I'm glad IFI is still localizing otome games, and Shinkai is a decent choice for both old Hakuouki fans and newcomers (so long as they integrate the new material well with the old). 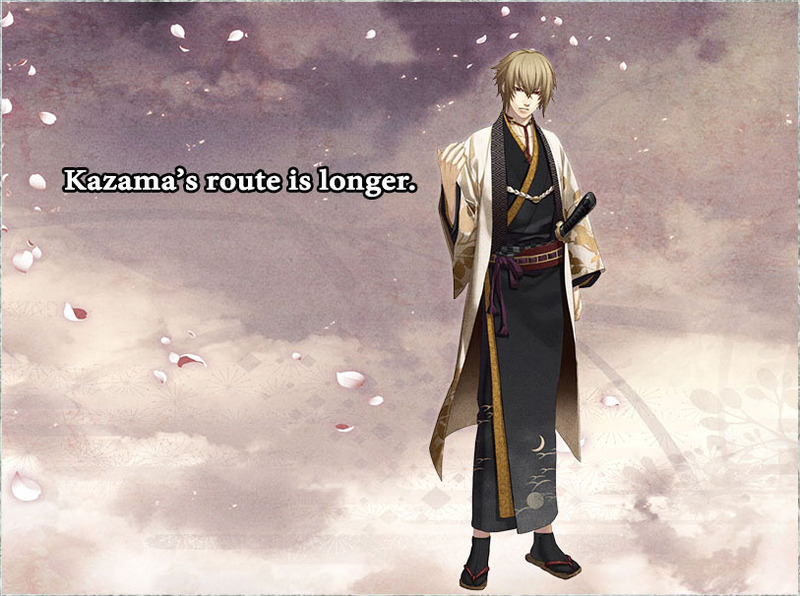 Looking forward to Kazama's expanded route, and Sanan's route. But Hakuouki series outsold every other Otomate IP by A LOT, so it is surely considered a "safe choice". I personally don't want to see SSL at all really. The art was so blah. At least the Yone-copycat-artists are better now, so Shinkai's new CG's look pretty good. Mangagamer are now having their annual licensing survey. I'm really excited for the new Hakuoki remake, but I was wondering if anybody knew for sure that both parts of Shinkai will be released? I know that they split the original game into two games, and the one coming out this spring is most likely the first one set before they leave Kyoto (Kaze no Shou). Does that mean they're planning on releasing part two (Hana no Shou) soon after? I really was hoping they could release them together Or at least let us know that they intend to localize the second part at some point so that we aren't all stuck on a cliffhanger for a long time. Oh my god, I would be so excited if Amnesia Later/Crowd was localized. Those two are definitely at the top of my wishlist. Amnesia was a day 1 purchase for me and I purchased it a second time later as a gift to my sister. Clock Zero also looks really interesting. I would love to see that, too, along with Diabolik Lovers and Wand of Fortune. Let's be honest though, I would be excited for any otome game Idea Factory released, and I'm already so excited for the four that are coming out this year. I'm really hoping that they go back to Amnesia though, because I would love to revisit those characters! VGP also happens to have Norn9 & Code: Realize for 22.04USD. imagine they aren't skipping out on Code:Rea PS4 either... gotta sell the milk cows. explain but I do not like playing the same games over and over and over again. to me but if they don't and only focus on the cashcows I may lose all fate in them. to my tastes and already played HKK and was content with ps3 ver. but thankfully is a lot tamer so that would be taking two birds in one stone. @Eylena: Since the Vita isn't getting much love westward, I wouldn't be surprised if Vita comes out as digital only whereas PS4 is physical in regards to the Code: Realize FD. I really hope not, since I don't own a PS4 (yet) but there is an untapped audience on the PS4, so having Code: Realize release there too isn't bad. Especially since nowadays, it's tougher to find Vita systems and/or PSTV systems that are at MSRP. Unless Sony comes out with a new, upgraded Vita, some otome games may start to migrate to PS4. I understand why Iffy picked up Kyoto Winds, as opposed to picking a new IP. Hakuouki is an established series with an established, devoted fanbase. It's popular and will sell, and after the chaos with Amnesia: Memories, I think Iffy is looking for another chance to test otome waters. Aksys has had decent success, but this is Iffy's second go at an otome, and Amnesia did have quite a few issues surrounding it (including the piracy one) so it makes sense for them to go to a well-established series that works, as opposed to try something that might fail. Also, if anyone tries to convince you or harass you into purchasing all the otome releases: don't give in, and ignore them. If you don't like the art, story, or anything else, you shouldn't be obligated to buy it just to show support. It's your money, so you should definitely spend it as you like and vote with your wallet. @PlateauFlower: The Vita definitely isn't a "dying console" but it is a neglected one, as far as Sony support goes. There's publishers that still release games for it, like Aksys and Iffy, but what I'm saying is I wouldn't be surprised if there's more ports to PS4, or games that have releases for Vita AND PS4. Especially since it's hard to get a new Vita for MSRP, at least here where I live, so tapping into the PS4 market is a good strategy since not everyone owns a Vita. Also, considering mobile games are really big in Japan, and that the PSP also lived longer than in the west over there, I'm not surprised the Vita is popular in Japan. I just wish some of those Vita recolors would make it over here. Sites like Amazon and GameStop have updated Collar x Malice. The cover artwork looks so nice! The release dates remain unchanged, but the site still says Summer 2017. NewEgg - they also have it as releasing 7/28/2017. Small update: checking the Aksys store, the Collar x Malice banner says July 28. Might be confirmation, but the website still just says Summer 2017. Can whoever is posting those really long weird lists please stop? It makes the page really long, and has absolutely nothing to do with the topic at hand. I don't know if reporting comments is a thing, but yeah. Anyway, can someone please fill me in on Hakuoki Shinkai? Apparently its only half a game or something? How exactly does that work? Because if that's true, I'd rather by both parts all at once, and I'll be able to put Hakuoki on the backburner for the moment. @Eri: Thanks for the find :3 Really Excited for CxM, and it does seem to be the (planned) release date. I really want Hakuoki Sweet School life and CLOCK ZERO EX TIME So freaking bad. I really hope someone localizes this. I am also still salty we aren't getting Beastmaster and prince! I also hope KBO will be localized by spike chunsoft or aksys! So happy about Aksys Announcements from AX <3 I'm still a bit sad about the cancelled IFI Panel, but I do hope that we're getting good news soon. Even if it's only the Release Window for Shinkai 2. Well atleast we're getting both psychedelica games,7'scarlet and code realize ps4 port. I love how aksys picks the more story/mystery centered otome games. due to it being stuck on a clockwork wheel(not impossible but requires work). I think its best to give up on this the story may be good as a whole but that's not enough. to take a break from all these story heavy games, tierblade would be great as well. Other games containing bigger complications have been localized. Anyway, I love the otome line-up we have for next year! I have yet to see an english otome vn game with a system mechanic such as CZ or others localized. to realize its a no go. as with SSL of we want to but we can't really do it now so its up to spike to force us. which doesn't seem have stuff that provides a challenge to turn into english. require more work so the simple ones will come first. It's been a while, thread! I hope everyone who picked up Edo Blossoms is enjoying it! On the game side, pre-orders for Psychedelica of The Black Butterfly are up on Amazon, Best Buy, GameStop and eStarland. April 27th release, though eStarland still has the 4/20 release date. Pre-orders for Psychedelica of The Ashen Hawk are up on Amazon and GameStop. Current release date is set to June 29th. Pre-orders for 7'scarlet are up on Amazon, Best Buy, GameStop and eStarland. Current release date is set to May 25th. Aaaand! Fashioning Little Miss Lonesome, the PC 18+ otome that came out last year, is getting a hard copy! It releases March 29th and comes with a Steam code, so it's great if you haven't picked it up already! But if you want to play right away, the download edition of the game is currently 20% off on Steam! OZMAFIA!! is 45% off on Steam, and the physical edition over on MangaGamer's storefront (NSFW?) is 25% off. Both are part of MangaGamer's White Day sale. As for news, Spike Chunsoft announced a stream on 3/23. They're announcing four new titles, so hopefully one of them is Kenka Banchou Otome! Now, for "rumors"... Last year, XSEED did a little game teaser over on their twitter. One of the silhouettes was discovered to be English Detective Mysteria. XSEED has not commented on this. So! General breakdown of what's been happening and is happening. A lot of this is pretty old news, but hopefully it helps someone out! Welp, XSEED just posted on their twitter a few minutes ago. There's a stream this Friday, 3/16, to reveal one of the mystery silhouettes. This could confirm English Detective Mysteria, but it could also be about the other two games. We'll see then! There's a lot I want to see localized, too! I'd like to see Iffy bring over SSL, since they're on a Hakuoki kick, but I'd also love for them to bring something new like Binary Star or Clock Zero. JJBA Vento Aureo confirmed, but not Amnesia Later x Crowd. London Detective Mysteria came out yesterday if anyone is interested. Its not exactly what I agree for a digital price but its fairly priced across US/EU for once, unlike Aksys. I haven't played it yet but its all downloaded.